Angelique B Sow is a former Patient Services Clerk/Scheduler at the Cleveland Heights Medical Center in Ohio. She studied Visual Art with a concentration in Fibers while pursuing her undergraduate studies at Kent State University: After completing graduate school and receiving her Master of Education degree in Community Counseling, she held various positions in the area of mental health and social services. She eventually returned to school at Notre Dame College of Ohio, where she pursued and received her licensure in Visual Art Education. Art for Ms Sow has been a vehicle for communicating holistic ideas, as well as making historical and cultural connections through symbolic representations. Much of her work focuses on symbolism, people, and nature. She mostly paints with acrylics, combined with mixed media. Bright and vibrant colors, natural and simulated textures, and creating a sense of three dimensionality on a two-dimensional plane are characteristic of her style. Over the past few years, she has developed a great interest and love for digital photography and imaging and design. Ms Sow is a Visual Art Teacher with the Cleveland Metropolitan School District. She has worked for several years with students creating murals and finding opportunities for them to excel in Visual Art. Ms Sow enjoys working with children and pulling out the many talents that so many of them don’t see themselves. The inspiration for “Boy at Six” comes from Ms Sow’s son. 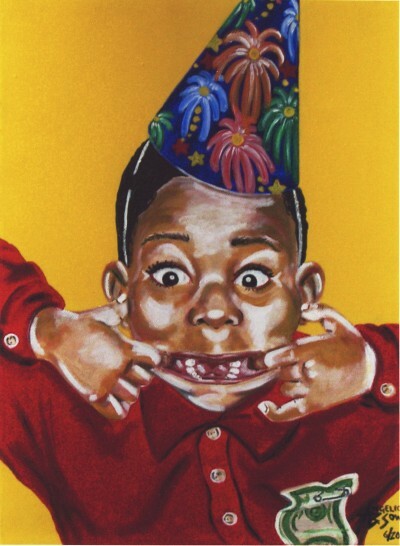 It is based on a photograph taken at his sixth birthday party. Ms Sow feels there is something so adorable about children and the facial expressions that they make, especially when they are least expected. Expressive portraits of children are some of her favorite things to create.